We offer sensible, movement-based yoga studio emphasizing functional mobility; the ability to move with ease and grace through daily life. We’re an affordable neighborhood yoga studio for regular folks, young and not so young, who want to get fit, stretch, relax and have fun. We are easy to find and convenient to downtown. We offer plenty of free parking and extra surprises. There are a variety of classes, most accessible to any active person. We have classes for the complete novice or first time yogi. Our level 2 classes challenge the most experienced yogi. There are classes for those who have an injury or are recovering. And there are classes for those who love to play hard and sweat. “Come as you are” approach– yoga is for everyone regardless of age or ability! Infrared therapeutic heating panels and beautiful space! 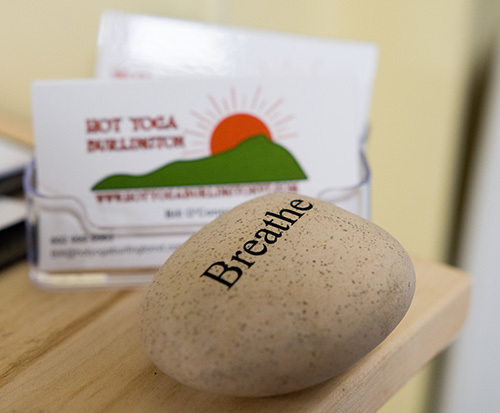 Top 10 reasons we come to Hot Yoga Burlington! Love how each class teaches a lesson or focuses on a theme. It’s never a repeat. The cold pebbles at the end of class are the perfect complement to the heat. Nothing like class at the health club! The new studio brings light and joy to each class. You will leave class feeling yoga stoned. Each instructor takes time to welcome new students and provides different options based on abilities and injuries. Andrea & Bill have a wonderfully welcoming studio…it’s easy to become part of this community. Unlike Bikram…the heat is not overwhelming…the infra red heat is therapeutic…you enjoy the sweat….and it make class easier! It’s a great workout….way beyond stretching. Studio owners Andrea & Bill are so dedicated to yoga…they even named their dog “Yogi”.